2. For the crust: Cream together butter, shortening and 1 1/2 cups sugar with electric mixer. Beat in eggs. In a separate bowl, stir together flour, cream of tartar, baking soda and salt. Beat flour mixture into butter mixture to form a stiff dough. Press dough into a rectangle as large as the baking sheet. 3. Bake for 10 minutes in the preheated oven, or until light brown. 4. For the filling: In medium microwave safe bowl, microwave vanilla chips and cream on high 60 to 90 seconds, or until chips are melted and smooth after stirring. Beat in cream cheese with electric mixer until creamy. Spread on cooled cookie crust. 5. 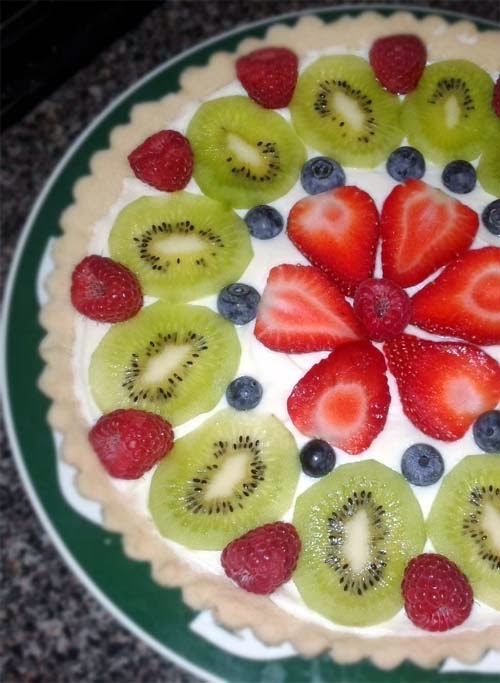 For the topping: Arrange sliced fruit decoratively over filling. In a medium saucepan over medium heat, combine 1/2 cup sugar, cornstarch, pineapple and lemon juices. Stir and cook until sugar dissolves and mixture thickens. Pour over fruit. Refrigerate until serving.